Aydori, capturing five women of the Mage-Pack, including the wife of the were Pack-leader. With the Pack off defending the border, it falls to Mirian Maylin and Tomas Hagen—she a low-level mage, he younger brother to the Pack-leader—to save them. Together the two set out on the kidnappers’ trail, racing into the heart of enemy territory. With every step the odds against them surviving and succeeding soar…. BP Note: This is fantasy not romance so please do not expect an HEA or HFN romance at the end. I’m a fan of Tanya Huff. When she started mentioning little bits about her new world and Napoleon and werewolves, I was pretty curious. Then when the title was announced and I was able to read the blurb, I had some serious book lust. 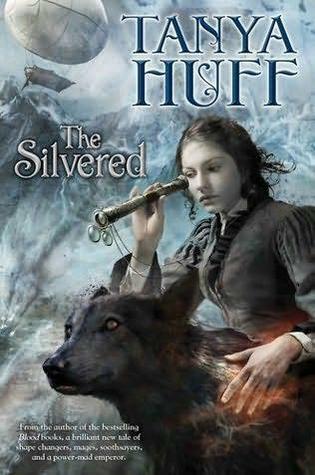 So I was really happy when Huff agreed to pay us another visit with a guest post, which posted earlier today. I had to interrupt my reading pleasure because of my day job but one of the thoughts that lingered was just how much research an author has to do when they decide to set their work in something familiar with a twist. I had recently spent some time studying the Napoleonic era so I think I picked up several of the little touches that bring realism to the world. I know I gained a whole new sense of appreciation for the work that goes into altering a world that allows the reader to keep the feel of something familiar while being immersed in something different. I certainly found the world Huff created to be fascinating. The inclusion of Weres not just in society but also as the elites of society in Aydori was a very pleasant change. They did not hide or make any attempts to disguise who they were. In fact the women of society pursued them because of their elite status. One of the things I liked about that was how the male Weres were attracted to women who had power – mage power. Mage power seems to only manifest itself in women so the young ladies who have it try to get accepted to The University for training so they then have a chance to marry into the Mage-Pack. Mage power has been divided into different categories each associated with a particular color. Those colors become flecks in the Mage’s eyes, almost like floaters but visible to others. The more flecks the more power that particular Mage has. Tomas was first introduced in the beginning of the book as he returned from a scouting run. While he was waiting for battle to begin, the Empire introduced a new horrible weapon that decimated Aydori’s army. He started off as a very young impetuous man who was driven by the thought of revenge and over the course of the story turned into a stable adult who could think through his instincts, support those around him, and face adversity. He certainly went through some extremely hard times on that journey but never gave up on his goal even when things were not looking good. Mirian was another great character. She was never a worthless society girl but didn’t have much backbone or drive to do anything different than any other society girl. While she would put up a token protest against her mother’s attempts to have her marry into the Mage-Pack, she still did what she was told. The Aydori nation had such trust and confidence in the ability of their military to stop the Empire’s advance that they continued to hold regular high society events such as opera performances. During one of those performances Tomas arrived with the news that the Empire had used a new weapon, destroyed the army, and was advancing towards the city. In order to control panic the Mage-Pack alpha declared that the city evacuation plan would allow walkers to start leaving immediately and carriages could start the following morning. In the meantime he and the rest of those who could fight would make their way to the front lines. By the time Mirian’s family was ready to depart they were among the very last of the carriages and consequently behind the Mage-Pack women. As a result she saw the kidnapping of the five women and made the choice to try to get help for t hem. That choice, completely contrary to anything her mother would have allowed started Mirian on her journey. Along the way Mirian discovered who she could be primarily because she didn’t know that certain things were impossible. Tomas and Mirian didn’t exactly have a smooth partnership when they first met. Each was out of their comfort-zone, in shock over recent events and desperate to make their piece of the world right again. Tomas lived with the guilt of knowing what had happened to his Mage-Pack. Mirian had to face being hunted, unable to really control her powers, and find a way to survive without civilization. It took a lot for Mirian to completely disregard the restrictions her mother had drummed into her head about things ladies did and didn’t do. Tomas was accustomed to having the support of the rest of the Pack and wasn’t prepared to be a lone wolf. Nor was he prepared for the fact that being a wolf sometimes meant he was in even more danger then if he had been human. As Mirian and Tomas continued to work and travel together they developed a true partnership with each supporting the other when necessary while relying on their specialized abilities. While Tomas and Mirian were the main characters the supporting cast was also extremely important. The Emperor, his elite forces, the Mages, and other people encountered along the way all made a huge impact. They were included for a reason and that reason often lingered beyond their scene. The way that Huff tied all of the strings together from this epic journey was masterful. She paid equal attention to her characters as she did her world-building resulting in a seamless whole. The melding of science, magic, era-specific technology, superstition, war and how ordinary people can do extraordinary things was captivating. Once again Huff succeeded in making the world around me vanish for several hours. Thanks for the review. I’m definitely going to take a look at this one. Great timing! I just got this out of the library. Having read the review, it is now the first book I’m reading! @Nicole: You are very welcome :). I hope you enjoy it! Wow, an Aplus! I do have some of her books on my shelves, looking forward to reading them. She is one of my goto fantasy authors and has been for years. Which books do you have? @Heller: Glad you liked the review. Currently it is a standalone but I am sure there is more that Ms Huff could write about the world. The story doesn’t leave you hanging at the end so I am happy either way :).